We give you a unique view into your beverage operations, without affecting the customer experience. Access anywhere, anytime. Our software connects operational pour data to financial data and makes it available for real-time analysis — providing a unique view into beverage operations that helps managers and owners maximize profits. Our new, all-digital beverage data collector is the most advanced in the industry—housed within a classic-looking package that features 73% smaller electronics, compared to our previous model. And we wrapped it around an industry-standard tapered metal pour spout, so your bar staff won’t need to modify their pour methods or counts. A bar is a harsh environment for a spout. Mechanical parts wear out and break. That’s why our engineers designed our new spout to operate using 100%-digital technology. No more mechanical on/off switches or sensors. A digital engage switch overcomes the #1 reason for spout data collection failure. And a digital tilt sensor provides accurate measurement regardless of pour angle. This spout is totally modular and designed to disassemble in seconds for easy cleaning and replacement of nozzles and corks. 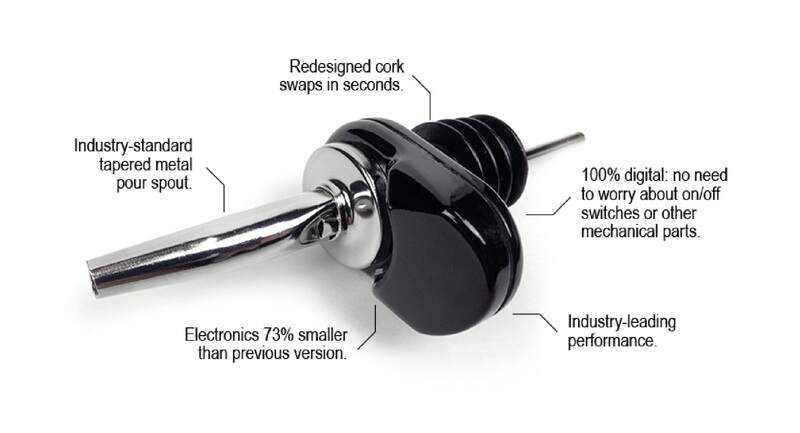 It is comprised of the industry-standard metal pour spout, the sealed electronics housing, and a replaceable cork. To disassemble, simply twist the cork 90 degrees and voila. It’s that easy. Corks come in a variety of sizes, to fit all bottle types. Our new spouts, web-based reports, and data center services are an integral part of what makes us a valuable partner, helping you run an efficient beverage operation. So contact us today to schedule your upgrade. You’ll find out why we say we’re Raising the Bar! Latest technology. Fully sealed enclosure. No leaks. We’re so confident in our new spout, we back it with a two-year warranty. If your spout fails for any reason within two years of purchase, we’ll replace it for free. Using proprietary power management technology, the spout merely sips power, for the longest battery life in the industry.